What? More black and white purple coneflowers? Can’t stop, won’t stop. 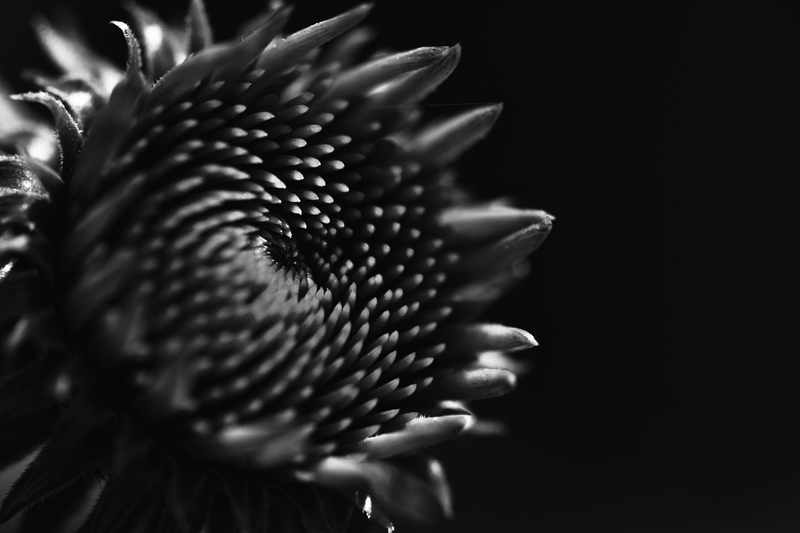 This is a natural successor to my shot last week; all the same principles applied rending a stark low key macro study of the echinacea flower. Approaching the shot from an angle this time allows the eye to travel through the shallow depth of field—in and out of focus—settling at the center point. It amazes me that this flowerhead was roughly the size of a nickel, and that despite its relative smallness it’s able to pack in all those stamen over such a small area. Not only that, it’s able to still create the feeling a room between them. No personal space issues here. As always nature is pretty cool.